As is often the case, through the vision, dedication and perseverance of a few, great things can be achieved. One cannot trace the history of Cleveland State without hearing about the men and women who devoted their time and skills, surmounting political encumbrances, skepticism, competition and sometimes-rigid opposition to make Cleveland State a reality. Their goal was reached in June 1965 when the State Board of Education officially named Cleveland as the site for a new community college. In 1958, the Tennessee General Assembly established a legislative council to study state-supported higher education in Tennessee. In 1960, the General Assembly produced the results of the study in the Pierce-Albright Report, which concluded that the district most deficient in terms of higher education was the Third Congressional District of Southeast Tennessee. In 1963, based upon the need identified by the Pierce- Albright Report, the General Assembly appropriated $200,000 for use over a two-year period to implement the findings of the report. Under the direction of commissioner J. Howard Warf, the State Department of Education developed plans for the establishment of a group of community colleges with the goal of placing an institution of higher learning within 50 miles of every prospective college student in Tennessee. In June 1965, acting upon recommendations of the late Governor Frank G. Clement and the State Department of Education, the General Assembly authorized the establishment of three community colleges, one in each Grand Division of the state. Thus began the work to bring a community college to Cleveland, Tennessee. Once the announcement was made to establish three community colleges in Tennessee, a campaign was immediately launched by the Chattanooga Chamber of Commerce to have Chattanooga selected as one of the sites. Recognizing the economic factors in having a community college in Cleveland, an insurance executive and former public school teacher, Frank Manly, appealed to city and county officials to organize and exert efforts to have Cleveland chosen as the site. A committee was formed which included Cleveland Mayor William Fillauer and Eugene Callaway, both personal friends of the governor; Hallman Bell, the governor’s Bradley County campaign manager; and John Dunlap, a state committeeman of the Democratic Party. These community leaders united with Frank Manly to initiate action. The State Board of Education mandated three conditions for a location to be considered as a college site: a contribution of $250,000, land in the amount of 100 acres or more and all utilities to the site. The committee immediately went to work speaking with influential individuals as well as organizations for support, including the Cleveland/Bradley Chamber of Commerce. Through the efforts of Grover Ash and others, the Bradley County Court resolved to provide over 100 acres of land that had become county property due to unpaid taxes. An agreement was reached by the county court and city commission in which each would provide $125,000 to meet the state requirement of $250,000. In June 1965, a committee was selected to present Cleveland’s bid to the state selection committee. On June 22, 1965, at 10 a.m., the hard work and dedication paid off. The State Board of Education announced that Cleveland had been selected as the site for one of the three community colleges. Exuberant newspaper headlines carried the news: “Officials Jubilant Over School,” “City Gets Junior College,” “Excellent Choice.” On October 8, 1965, Commissioner Warf announced that an architectural firm for Cleveland’s new college had been selected and, following the approval from the State Building Commission, a contract for construction would be signed. 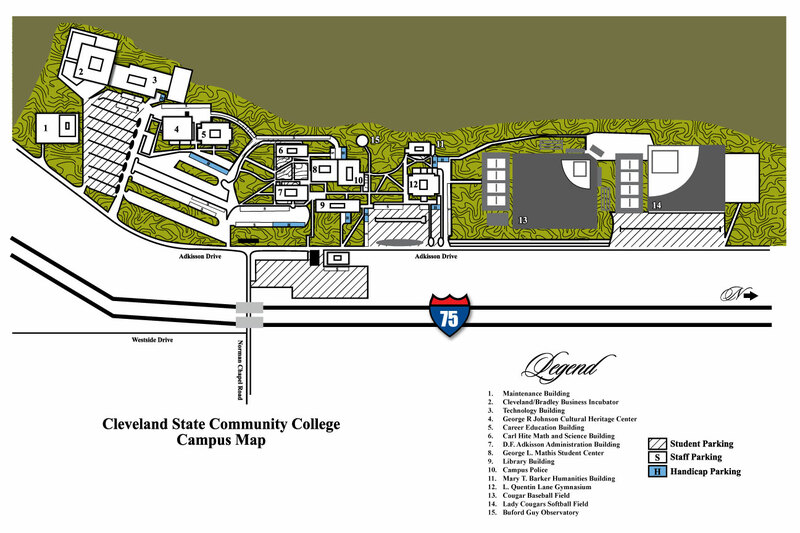 Cleveland State Community College received its official name in February 1966 after the State Board of Education issued an edict declaring that the name of the state’s three new community colleges should contain the name of the community in which each was located. Dr. David F. Adkisson was appointed president of the new college in January 1967. Temporary offices were opened at 623 Broad Street in a converted residence. It was in the spring of 1967 that the task to recruit the first class was begun. Without physical facilities, fancy literature, equipment, a faculty or even firsthand information of what the college would be like, Dr. George Mathis, Dean of Students, began a monumental sales task. In August of 1967, the first college catalog was published. Associate degree programs were offered in 17 fields of study with both day and evening classes of the continuing education program. Not less than 98 quarter hours of credit, including physical education, were required to obtain an associate degree. In addition, a number of certificate programs in concentrated areas of study were available. A total of 30 credit hours of course work to obtain a Certificate of Proficiency were required. An Adult Education Program for “personal enrichment” and an extensive summer program of course work were also offered. For full-time students who were residents of Tennessee, tuition cost was $50 a quarter and registration was $5 a quarter. In a short time, Cleveland State became a major force in the community. Enrollment increased steadily and new course offerings and degree programs were continually added to meet the needs of both students and area business and industry. Skilled and community oriented instructors were drawn to the challenges of a new concept in education as well as the opportunity of working in an attractive area. In 1969, Cleveland State received accreditation by the Southern Association of Colleges and Schools to award associate degrees. In 1994, reaffirmation for accreditation was again received. Through the years, construction and expansion of buildings rapidly progressed culminating in completion of the Community Services Building in 1979. Approximately 3,200 credit students and 1,500 non-credit students enroll in Cleveland State Community College in a typical fall semester. The credit student population is split about evenly in the choice of transfer or career-technical programs. The average age of all students is 28 years. All persons are welcome at Cleveland State, and the student population is nonracially identifiable. There are over 200 employees at the college, including more than 70 full-time faculty members. Eighty-six percent of the faculty hold master’s or doctor’s degrees. Situated in the scenic corridor of hills and valleys of southeast Tennessee, Cleveland State presents an attractive atmosphere in which to enjoy varied facets of an educational experience. The community offers an abundance of service facilities and recreational opportunities. The college is located between Exits 25 and 27 on Interstate 75, 30 miles northeast of Chattanooga. The 105-acre campus has ten major buildings housing modern classrooms, laboratories and student activity centers. Additional features include an excellent library, a multimedia Center of Emphasis, computer laboratories, a 400-seat theatre, a 3,000-seat gymnasium, athletic fields and tennis courts, a large reflector telescope and a satellite downlink receiver which enables the college to serve as a site for many teleconferences. Cleveland State offers classes throughout the service area which includes Bradley, Meigs, McMinn, Monroe and Polk Counties. The college also maintains a off-site locations to serve students locally. The college offers a wide selection of credit and non-credit courses at the off-campus locations in Athens and at Sequoyah High School in Madisonville. In addition, many college support services are available at these sites to assist students in the college’s northern service area.